This photo will have to do until I find a better one. The town of Beaumont is located at the summit of the San Gorgonio Pass at a point where the valley widens considerably so that the distance is five to six miles between the foothills of the San Bernardino range on the north and the San Jacinto mountains to the south. 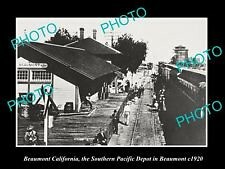 The elevation of the town is estimated at 2,600 feet, Beaumont being the highest point on the Southern Pacific line between Los Angeles and Yuma. A most magnificent view of the mountains is afforded the residents of the place. It has been seen that the very earliest known settlements of Spanish and later of whites in the pass were located in the northern part of what is now Beaumont, although there was no town at all at that place until about 1884, and then it was known as San Gorgonio. Its present name was received about 1887, when a company of capitalists purchased the lands in the townsite. Notwithstanding the fact that there was no town, a railroad depot and telegraph office were established there in 1875, and for many years this marked the summit of the pass. In June of 1884 George C. Egan built his first store at San Gorgonio, near what is now the center of the town, on California avenue. Previous to that date Egan, who then had a store at Banning, had bought land from the railroad company and he sold his Banning property in order to make the last payment on this land, which comprised the odd sections in and about the present town of Beaumont. Egan also procured the other lands there, so that he owned practically the whole townsite. As soon as he had made his last payment and owned the property clear, he borrowed money on it and built the store, thus starting the town. In 1884 also a man named Parrish built a tiny place south of the railroad track near the present location of the roundhouse, and kept a little store there. Egan had a postoffice in his store and was the first postmaster, although a man called "Old Man" Lamb handled the mail that was thrown off the trains for the residents for a short time, unofficially. Both stores, in common with many of the frontier stores of those days, kept liquor, though at that date there was no regular saloon in the town. The railroad station, a small red building, which housed the telegraph office as well, a turn table and water tank, which was then supplied from a well sunk by the railroad company, and a very few other buildings made up the town. The Summit house, the first hotel in Beaumont, which in a remodeled and enlarged form is in use today, was erected in 1884, also. There were no trees anywhere about the town, which presented a cheerless appearance The water supply in early days was all obtained from Noble canyon, from which flowed a small stream, which was piped to the town. A few years later Egan built another store building, moving his business to a corner opposite the Summit house and across from the depot, on Egan avenue, which was named for the pioneer. Grace street in Beaumont was named for his daughter. People began coming into the town in 1884, and that year R. P. Stewart and Dan Scott commenced raising grain. Both these ranches are still known, and Stewart is still a resident of Beaumont, having his home on a grain and hay ranch. Dr. McCoy came to San Gorgonio in 1884, and located on a ranch near the northern foothills. Horace Roberts was living in what was later known as Cherry valley that year, and in 1884 J. J. McCoy built a house for his uncle, Judge McCoy, near the other McCoy ranch. The Armstrong, McMillan, and R. T. Jenkins families were pioneers of 1884 in the town. Thomas E. Mellen was at the old Edgar ranch for some time, later moving to his place in the hills overlooking the pass. Mrs. Barrett, who had formerly lived near Banning and whose son’s tragic death has already received mention, moved with her family to San Gorgonio about that time. In the fall of 1886 a company called the Southern California Investment Company purchased from Egan all his holdings at San Gorgonio, and somewhat to the chagrin of the old settlers, changed the name to Beaumont, though there was some talk of naming it Summit. This was necessarily given up when it was found that another postoffice of the same name existed already in California, and Beaumont was adopted as the new name in 1887. The company proceeded to "boom" the town. They planted eucalyptus, pepper and other shade trees along about twenty miles of streets which they laid out. They purchased with the other lands the Cherry Valley tract and the Noble canyon land where a reservoir had previously been built, and the old Edgar ranch and the canyon with the water. They did not develop the water, however, and the town was still supplied from Noble canyon. At this time the chief industry of the town was the raising of grain and hay, and very little fruit had been planted. Beaumont had grown somewhat, and the place was prospering, while new activities had sprung up. But in 1888, the year when so many rising towns of Southern California fell victims to the too great and too sudden inflation of property values which had taken place, the boom in Beaumont burst, and the ambitious plans of the company went flat. H. C. Sigler, one of the directors of the investment company, who had great faith in the possibilities of the place in which his company had already sunk thousands of dollars, made desperate attempts to procure additional capital with which to continue the work, but was unsuccessful. The German Savings and Loan Society of San Francisco had already loaned money to the company and held a mortgage on the townsite. For a good many years after the misfortune of 1888 the investment company clung desperately to their property, the bank pursuing a liberal policy with them, but finally being forced to take over the land and water at Beaumont. When the townsite passed into the bands of the bank the new owners never attempted anything in the way of development work, and the condition of the town was not improved. The bank refused to sell the lands except as a whole, and no ready buyer was at hand. In 1888 some trouble arose over the Edgar canyon water, where the Little San Gorgonio creek flows down from its origin higher in the hills, and the investment company brought suit against George Wilshire, James W. England et al. to quiet title to the creek and prevent them from diverting the water to the Redlands watershed, as had been done for several years prior to that date. Wilshire was a rancher who owned a place in the hills north of Beaumont, and England was one of a company which made arrangements to obtain water for the valley the other side of the hills. They claimed rights to the water under dispute and fought the case, which dragged for years and years. When the bank took over the property from the first company they also assumed position as plaintiff in the suit, and it was finally carried to the supreme court, where the court gave a decision for the bank, and issued a perpetual injunction which effectually restrains anyone from diverting water to the Redlands watershed. The stream, which is used both on the hills and farther down for irrigating purposes, now empties into the Edgar canyon, where water for the town of Beaumont is at present developed. In 1890 Beaumont, though crushed under the weight of the failure of two years before, had grown somewhat. The railroad had quite materially enlarged its interests at the summit town, having built a large depot about 1887, and added a small engine stall to the turntable and water tank which it already had in use there. This little roundhouse was later removed to Banning, when the local train which has already been spoken of in connection with that town was added to the schedule, and a second and larger roundhouse built at Beaumont. In the year of which we are speaking the business portion of Beaumont included two stores, one saloon, post office, livery stable, three hotels, a grain warehouse, built in 1885 and enlarged later, a schoolhouse, and two churches, besides other buildings. The residences were of much better class and a good deal more numerous than they had been six years before. There was not a very sufficient water supply, however, and as the suit over the Edgar canyon water dragged on, and no water other than that in Noble canyon was developed or used, the place was very much at a disadvantage. No orchards or crops requiring irrigation were planted, and for years the dry farming, which resulted in fine crops of grain and hay, and the fact that the railroad company steadily increased its activities at Beaumont kept the place alive. Ranchers raising the mill staples about Beaumont for the most part leased the lands from the company, and later from the bank, and the fact that year after year the same acreage produced heavy crops of barley, oats or wheat, proved the excellent quality of the soil. One of the most expensive improvements which the first company installed was a large hotel, which was erected in 1887 at a cost of about $40,000. This was always a financial failure, especially after the end of the boom, and although several attempts were made to keep it open it was found unprofitable, and the house was finally closed and placed under the care of a watchman. This hotel, first called the Beaumont hotel, was one of a chain of expensive buildings of the sort which were erected about the same time in many Southern California towns which were in the booming process. In some places these buildings were never even occupied, but stood unused until destroyed in one way or another. In 1907 the Beaumont hotel was renovated and reopened, under the name of the Edinburgh hotel, but its history came to an abrupt close in August of 1909, when it was destroyed by fire. The Summit house has already been mentioned as the first hotel in the town, and in 1886 the second hotel, called the Del Paso, and owned by Mrs. M. M. Fisher, one of the old residents of the place, was built. It still occupies its original site south of the railroad track, and is in operation. In 1884 the Smith ranch, mentioned heretofore, was bought by a company of capitalists. They built a large three story house and improved the grounds about it. One of the owners, a man named Veile, opened it as the Highland Home hotel. It was used for this purpose for several years. In 1887 or 1888 Palmer & Halliday of Santa Ana bought the place and proceeded to set out quite an acreage of fruit trees, including olives, cherries, peaches and grapes, which have since proven very profitable. For a good many years olives from the trees then planted have been pressed at the ranch and made into oil, and the cherries particularly have been known for their excellence. The company nearly completed a huge reservoir on the lower end of their territory, which stands unfinished today. The water for the irrigation of the ranch then, as now, was obtained from a canyon in the hills close by, called at present Black’s canyon, from the fact that Sam Black once made his home there. The Palmer-Halliday Company held the ranch to within a year ago, when it was bought by Riverside capitalists. After the first postoffice was established in San Gorgonio, and later when the old Spanish name was changed, the various postmasters who succeeded Egan maintained the office in some corner of different store buildings. In 1908 Postmaster James Kelly, who is one of the old residents of the place, moved the office to a separate building on Egan avenue, where it is now conducted. A rural delivery route was established in April of the present year, to accommodate the many residents living on the outskirts of the town. This is an eighteen mile route, and serves over 100 families. In 1887 a weekly newspaper called the Sentinel was published by a man named McDill, who edited the paper for a time and then sold it. It subsequently passed into one or two other hands and soon went out of existence. For many years Beaumont, like its neighbor Banning, had no newspaper, but in 1907 The Independent was started there. It had a very brief existence, and it was not until 1908 that the Gateway Gazette, with Arthur J. Burdick as editor, was established. In 1909 another paper, the Beaumont Leader, was first published, and the two latter weeklies are at present being issued, both of them being printed in Beaumont. In the fall of 1884 the people of San Gorgonio saw the necessity of establishing a school, and when the first church building was erected that year, school was begun there. In 1885 a school building was erected, only one room being completed at that date, and Miss Foy, the first teacher, commenced her work there. This building, somewhat enlarged, is still in use and is now called the Olivewood school, serving as the grammar school for the town. In 1909 a school was constructed in Cherry Valley and is used as a primary school to accommodate the residents of that part of Beaumont. The same year a high school was commenced, the sessions during the terms, of 1909 and 1910 being held in store buildings, and later in a big tent. These makeshifts were in use while a fine high school building was in the course of erection, and in 1911 the school began its occupancy of the new structure. A private kindergarten was opened in 1910, and continued for part of a year, but no such institution has ever been run in connection with the public schools. In the days of the first school a mere handful of children made up the attendance, but during the last term there were nearly 200 in the schools, and eight teachers were employed. It is a little klown fact that in 1887 a site was laid out on Cherry Valley for the Presbyterian college, Occidental, but for some reason the plans which had provided for the establishment of the institution at Beaumont were never carried any farther. The first religious service ever held in the town was in a little house which stood south of the track. This was conducted in 1884 by a Congregational minister, although no church of that denomination was ever established at Beaumont In October, 1884, a few Presbyterians met together at the home of R. T. Jenkins and organized the first church. Their building, which they erected in 1884, is still in use. Their first pastor was a Rev. Bransby. In 1887 the Methodists formed a church, erecting their building in that year. Rev. Hilbish was the first minister to serve this ‘church. For a good many years the preachers of the Beaumont and Banning Methodist churches exchanged pulpits, although the latter church was not organized as soon as the former. In 1901 the United Presbyterians of the town, who had organized a few years previous, obtained possession of the Methodist church building, and are at present using it. Their first pastor, who still occupies the pulpit of the church, was Rev. H. P. Espy. In 1909 the Catholics of Beaumont built a substantial church on Palm avenue, under the direction of Father Hahn of Banning, and Father Golden was the first priest put in charge of the new organization. A small group of members of the Christian church held meetings for a time in 1911, but never organized a church or had a regular pastor. There are at present two cemeteries in Beaumont, although for a good many years the old Beaumont Cemetery, which is situated south of the town, near the foothills, was the only one. In 1900 the Mountain View Cemetery was started, this being located in the northern part of the town. During the ’90s the population of Beaumont remained between three and four hundred, the fact that the townsite was not available for subdivision holding back the community. Water was still scarce, and an idea which caused much injury to the place became prevalent about this time that no sufficient supply of water could be obtained, and possible investors, who came to investigate, were frightened from the prospect of buying a town without enough water. The trees which the first company had planted along the streets had made excellent growth, although they had received practically no attention, and the majority of the streets were not in use. Into this "sleepy hollow" in 1907, just twenty years after the Southern California Investment Company had commenced operations, came C. B. Eyer, a capitalist who had purchased the town site from the bank, and who was not dismayed by the bugaboo of "no water," which had prevented other capitalists from investing in Beaumont. The town yawned, stretched, and woke up. The Beaumont Land and Water Company, which was formed in October, 1907, bought from the first purchaser his new property, and at once began the process of rejuvenating the town. The same year the domestic water company, the San Gorgonio Water Company, of which K. R. Smoot is president, was formed. The first directors of the land company were Messrs. Stephens and Gates. Going at once to the root of the matter the new owners began the work of developing water. At the same time they replatted the townsite and began the sale of the land in subdivisions, both town lots and acreage. The two companies own and control the water rights. The irrigating water is sold under a system which provides that purchasers of company lands can procure also certificates which give them the privilege of buying water for those lands The first attempt of the new water companies to obtain water was by sinking wells in the valley, but the location chosen proved barren of water and was immediately abandoned. A well was sunk in Edgar canyon and proved much more productive than was hoped, even by the sanguine directors of the company. A fine flow of water was obtained, but work did not stop with the first well, and at present the companies have six wells in the canyon. The theory which had prevailed for years that water could not be developed was done away with, and the town began a new lease of life, working on the more encouraging theory that water would be assured. The Edgar canyon water was at once piped in a new distributing system to the town, the Noble canyon stream also being used. The old reservoir in the latter canyon was used by the new company, and a small reservoir was built in Cherry valley. In 1911 a reservoir up in Edgar canyon was built, and the company also uses power pumps in the canyon. With the new water supply, piped not only to the town, but to the valley where the subdivisions were laid out, the growth of the place commenced. The new water distributing system added about forty miles of steel and concrete pipe to the meager number which then existed. In 1910, just three years after the company took charge, the population had reached over 1,100. Although a great many changes have occurred within the town, as it was formerly laid out, the most noticeable growth and development have been in the valley to the north. Here the lands, which were for many years occupied by grain fields, were subdivided, and investors built houses where there had never been a building before. Orchards of apples, cherries, pears and peaches were planted, and are at present making good growth. The fine fruits obtained from the orchards at Highland home, and at the Mellen ranch, where fruit so choice that it was awarded a prize in the World’s Fair at Chicago in 1893, was raised, were examples to newcomers. It is estimated that there are now over a thousand acres of fruit trees planted in Beaumont, exclusive of the old orchards, a great many of the new trees being varieties of apples. The greater part of this new acreage lies in the valley north of Beaumont, toward the foothills, in Cherry and Apple valleys, and in the neighborhood of the old Edgar rancho, where pioneers planted grapes. Although irrigating water is available, the majority of the ranchers do not often take advantage of this fact, preferring to depend upon the rainfall, to a great extent, and to the quality of the soil which holds the moisture. Some of the recent purchasers have sunk wells successfully in the valley. Besides the orchards, a great many vegetables have recently been produced, and fine berries are raised. Hay and grain are still raised in quantities. The residences in the town increased rapidly in numbers to accommodate the sudden growth of the population after 1907, and at present there are many comfortable homes in Beaumont of neat and attractive appearance. A special subdivision, which the presient company exploited, is on the hills overlooking the whole valley north of the town, and is called La Mesa Miravilla. Here there are several residences of unusual beauty and value. It is interesting to note that this choice district was in the early days considered of no value, and thirty years ago a man declaring that it would some day be a site for country homes would have been considered insane. This is simply one instance of the present developments in the pass which the earliest settlers never imagined in their highest dreams. In the business section of Beaumont, which at present, as always, has been located for the most part north of the railroad track, very marked changes took place after the arrival of the new company. Before that date the railroad company had again built a roundhouse, this third building being a place of some pretensions. Whereas the company formerly obtained water for the tank which supplies engines, from a well, it is now connected with the water company’s system. The business section gradually grew eastward, from the original center, and is much more extended than formerly. There are four groceries, two hardware stores, two furniture stores, a dry goods store, bakery, two clothing stores, a drug store, two confectioneries, a meat market, a fruit and vegetable market, a livery stable, two garages, and a rolling mill for grain, besides other places of business and amusement. The matter of incorporation of Beaumont was placed before the voters for the third time November 6, 1912, when the vote carried and Beaumont became a city of the sixth class. J. J. McCoy was chosen president of the first board of trustees of the city. Many years ago the last saloon went out of existence in Beaumont, as in the remainder of the San Gorgonio Pass, for when the valley became a part of Riverside county in 1893 it also became a prohibition section. A small "calaboose," built in 1909, is located south of the railroad track. Among the important enterprises in Beaumont is the state bank, which was founded in 1910. A gas plant was also installed that year. In 1911 the present public library, which occupies a room in the Beaumont bank building, was established. There are few lodges in the place, the most active being the Odd Fellows, organized in 1909, and the Rebekahs, which came into existence early in 1912. A Fraternal Brotherhood chapter also holds a charter in the town. The Odd Fellows own a fine building, in the second story of which they maintain their headquarters. The business men of the town have a board of trade, and maintain rooms on one of the main streets. The women of Beaumont have among other organizations a club called the San Gorgonio club, and a branch of the W. C. T. U. The latter recently installed a drinking fountain of good design on the corner by the postoffice for the benefit of Beaumont citizens. The importance of the place as a railroad town is shown from the fact that there is a branch of the Brotherhood of Locomotive Engineers and Firemen there. Beaumont shares with the rest of the pass the advantage of its proximity to the mountains and desert, both from a standpoint of climate, and from the fact that the mountain resorts are easy of access. In the hills to the south is the Wolfskili ranch, which in the early days was a part of a Spanish land grant, besides other ranches which have been maintained for many years. Recently a few homesteads have been taken up in the lower foothills south of Beaumont, where land has been cleared. The road to San Jacinto, now used as an automobile road, has been in existence since the early days of the town, and formerly a stage line between San Jacinto and San Gorgonio was run. A road was built this year to connect the town with the Yucaipe valley, and Beaumont avenue, which runs northward from the center of the town to the foothills, is extended into an automobile road into the hills. This road leads to Redlands, via a mountain resort known as Oak Glen, which although it is in San Bernardino county territory, has Beaumont as its postoffice. The road to Idyl wild, in the San Jacinto mountains, is also easily reached. Beaumont is not quite old enough to have felt the effects of the lumbermen’s desire to enjoy their "high jinks" in the valley, as did Banning in the old days, but, nevertheless, life in old San Gorgonio, and later in Beaumont, was not without its hardships and excitements. One story is told by an old settler, concerning a Mexican who was found one morning apparently "dead drunk." He lay for some time in the road where he had fallen, and then a party of Ms countrymen took him up, and without very much investigation, assumed that he was really dead, and buried him The people of Beaumont are today, in common with their neighbors in the pass, a sober, industrious people – good citizens in every respect.